I am calling this post Steamboat Potluck Party 2010 because I went for a similar one in 2009. In fact, it's hosted by the same person. If you've been following my blog since the beginning of last year, you would have probably read about that potluck party. Anyway, to refresh your memory and for the benefit of my newer readers who may want to know about the hilarious Kickapoo joke and how my mom thought I was calling for prostitutes, click HERE. 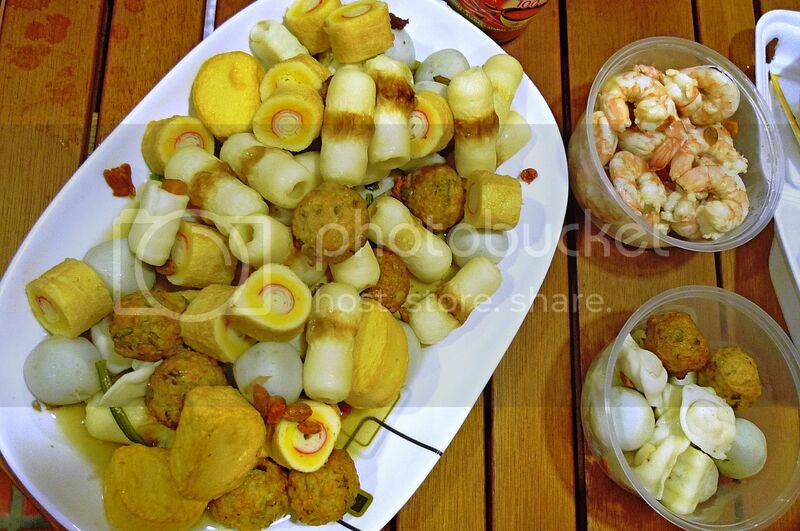 This potluck party was held two Sundays ago at my friend's home in Sri Petaling. When I saw what was on the table, my saliva instantly flowed. Haha! These were painstakingly prepared by my friend, the host. 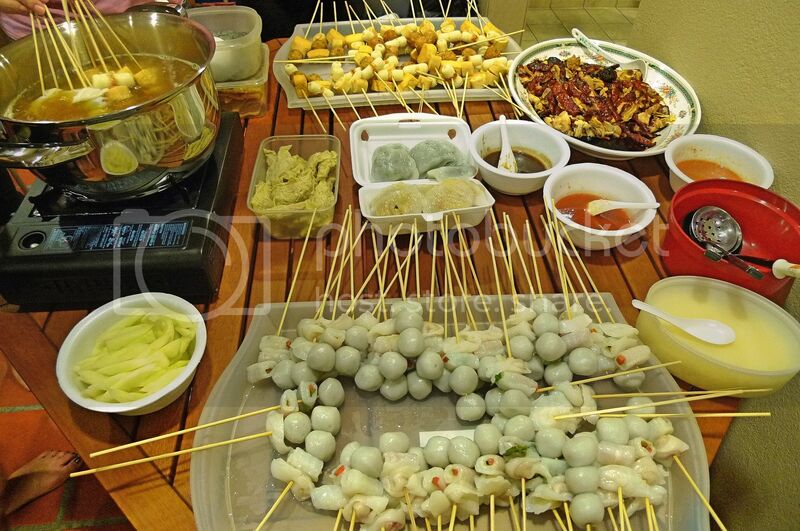 There were about ten of us and each of us took turns to dip these fresh ingredients into the steamboat to cook them. 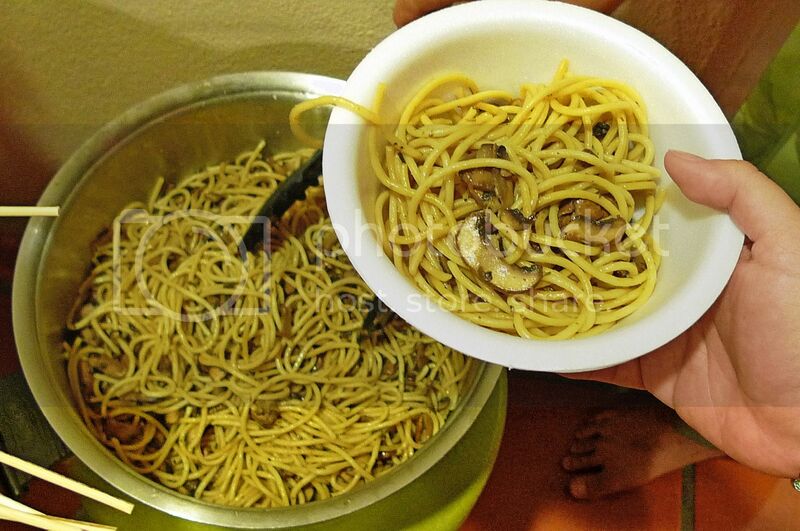 Don't you think this way of eating steamboat is more convenient, not to mention more hygienic? Better than everyone dipping his or her chopsticks into that pot of boiling soup, right? 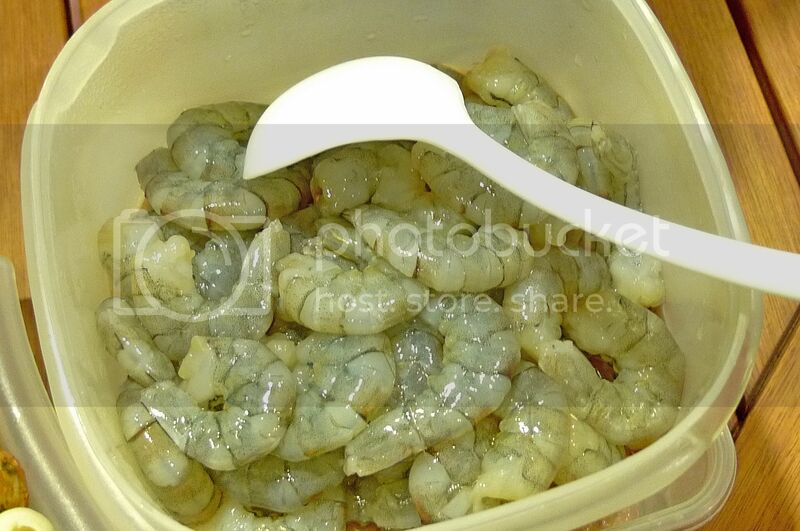 When I saw these prawns, I was like, Oh My God! I must have them! I must!! And so I took loads of those prawns and cooked them in the boiling pot. 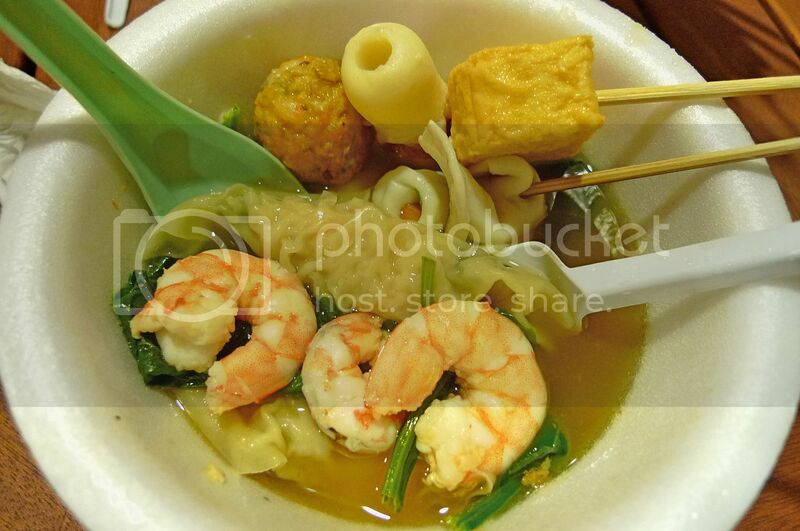 And here's my bowl of yummylicious cooked prawns and sui gao (minced meat and prawn dumpling) amongst others. The soup was so tasty! Later the host showed us what she put into the soup. No wonder it was so tasty! I gave the steamboat three thumbs up! Haha! Now since this was a potluck party, everyone would be bringing something. I brought loads of prawn crackers that I bought from Kuala Selangor. Oh! Forgot to take photos of them, but I think you have already seen them in one of my previous posts. So what did the others bring? Well, someone brought home-cooked spaghetti. I can tell you this spaghetti was totally delicious! I took 2 bowls of it! 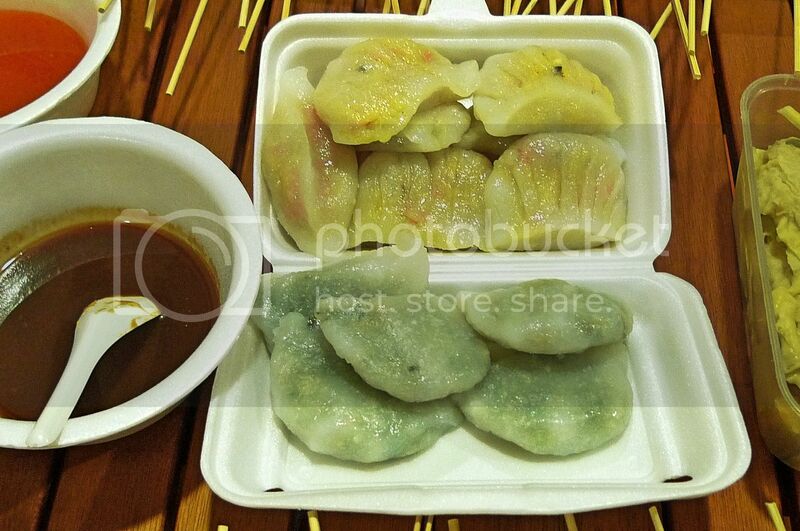 I didn't get to eat these dumplings as I was too full by then! But I was not too full for this apple raisin soup dessert! Haha! 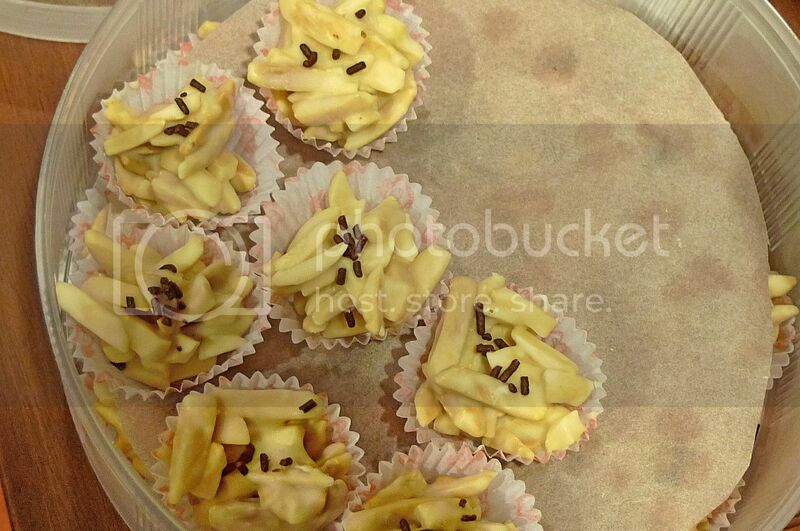 Look at those chunks of apples and the generous amount of raisins! The dessert was nice - sweet and sourish at the same time. I went for a second helping! We also had some cookies leftovers from Chinese New Year. Believe me, after all those delicious food, cookies would be the last thing on your mind. But I found these cookies delicious and I didn't even know what cookies they were! Another friend brought some yam cakes, but frankly, I was too full to eat them! Towards the end of the potluck party, our host came out with a mysterious red box. What was inside this red box? Quick! Open it! Chocolates from Shangri-la Hotel! Wow! 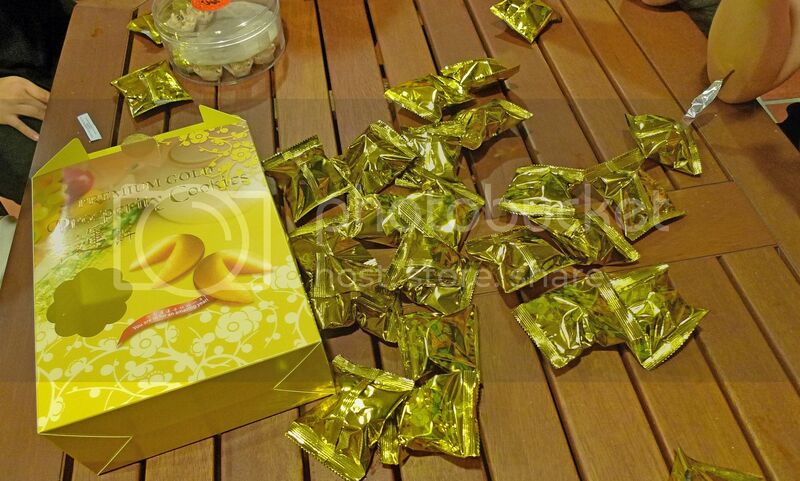 Most of the chocolates were eaten up already, but fortunately, the remaining ones were enough to go round. 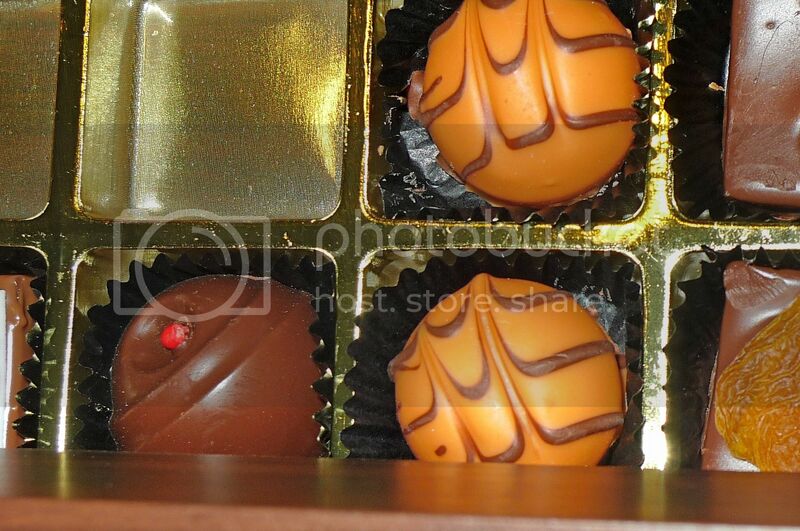 Close up shots of the chocolates. Don't you think the ones below look like mahjong tiles? Haha! I didn't really fancy the chocolates though I like the box! I asked my friend if she could give me the box in which she replied with a very firm NO! LOL! Someone brought some fortune cookies and we had some fun choosing our fortune cookies! Each of us broke open the cookies and read out aloud what was written on the paper. It was fun! Yay!! I love the message! I always look out for the rainbow when it rains cos you all know right, that there's a pot of gold at the end of the rainbow? haha! Passion fruits! The uglier they look from the outside, the tastier they are. That's what one of my friends told me. Yummy!! We actually could not finish the steamboat. Look! The remaining ones were packed into containers which some of us took home for our next day's lunch or dinner. How nice! A potluck party with take-away food! This must be the best steamboat potluck party for me ever! My friend, the host said she had decided to make this party a yearly event. Yippee! Before we left, our host reminded us not to leave anything behind. I quickly blurted out, "Oh! Where's my box?" "What box?" she asked, puzzled. "That chocolate box from Shangri-la." She gave me a look and said, "Yeah, right!" Haha! I am so looking forward to next year's potluck party! Isn't it my lucky day today or what????????? Fuiyo... must go buy lottery dy!!!!!!! Doing the victory dance here.. :P Hands in the air!!!! I'm so happy now foong.. you made my day.. i've not been having enuf sleep.. but THIS is definitely WORTH IT! 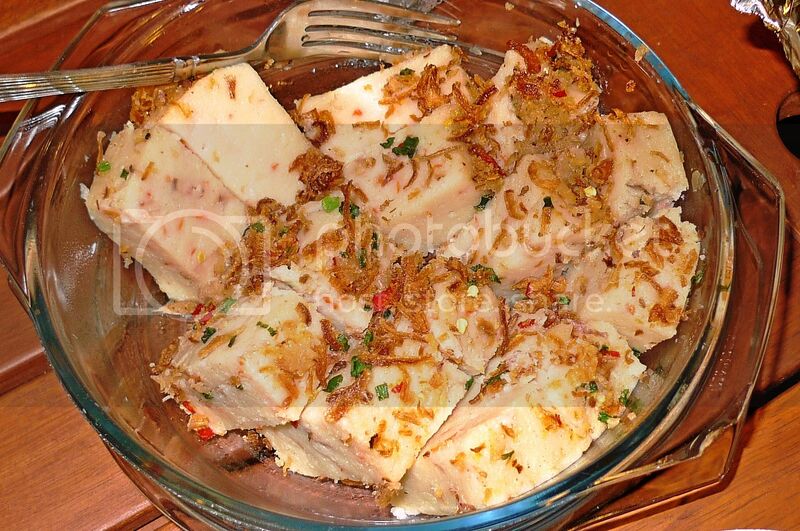 Da one that you said look like Mahjong is actually firecrackers izit? So cool!!! Can i join in 2011 Streamboat potluck? Just look at those glorious food. War...there were spaghetti, roast chicken, chicken wings, dumpling and apple raisin soup? Goodness...you guys really know how to eat o.
interesting steamboat party. Why is it call potluck? YUM with Aloha from Hawaii my Friend! wow. invite me next time and i'll book a ticket on the way there. yummy. I like steamboat but have yet to find a good one in restaurants. Home-made steamboat is still the best. Food! food! food! Sure to 'rock' the steamboat with so much food. Wowie you had two bowls of spaghetti on top of all the nice food? Either you have an elephant stomach or could be very small servings of spaghetti. So how many strands of spaghetti you 'downloaded' for each bowl probably less than 10? haha. thanks. hey it looks so fun!!!! i miss steamboat :( and oh yeah! 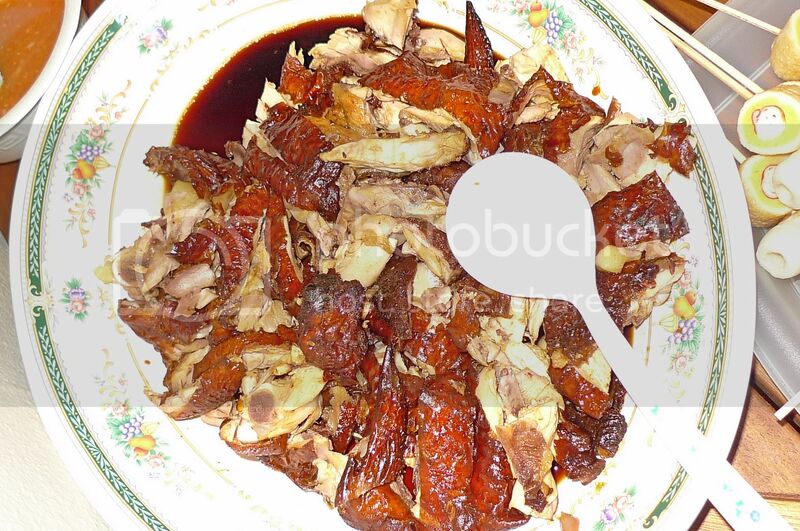 i found that if you have left over roast duck parts, make it as part of your stock when cooking the soup, it will taste like heaven! i "hate" ur bloggie for making me so hungry for foods nowdays! hey foong I'm here!!! baby's sleeping and mommy's sneaking!! that gave me a new idea, steamboat dip-dip. tekkaus, yes there will be potluck party every year from now onwards! LOL! 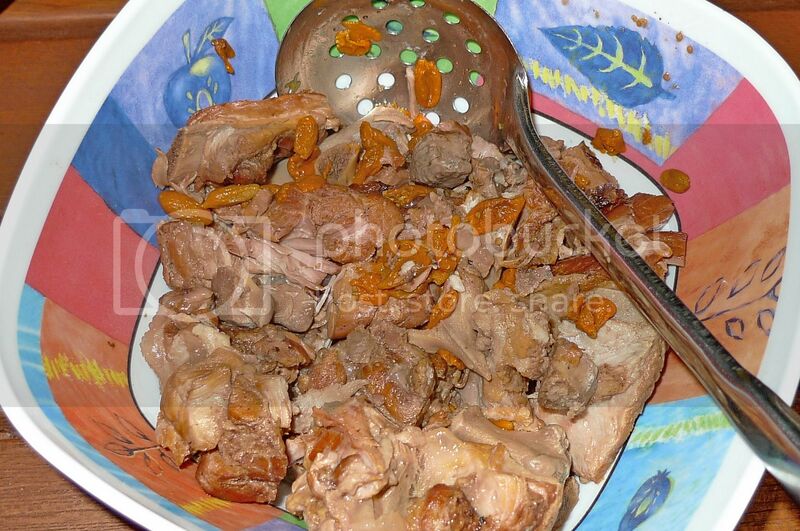 Yes, she put in pork meat and chinese herbs. That's why the soup so delicious! 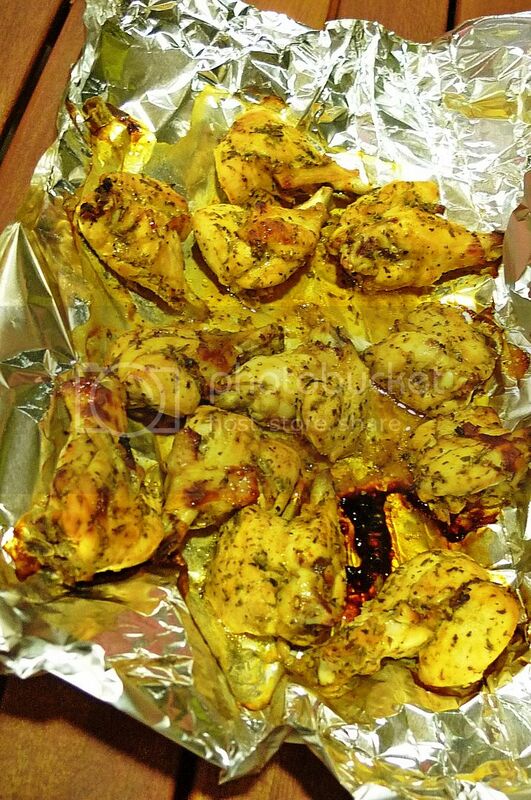 lawstude, you'll fly all the way to Malaysia for a potluck party? Haha! Sure will invite you and I think we can start our very own potluck! Haha! cheahs@n, I think I have an 'elephant' stomach. Hahaha! eiling lim, haha! Where can feed the whole kampung? You must be kidding! LOL! bananaz, I will just ignore that note! Haha! 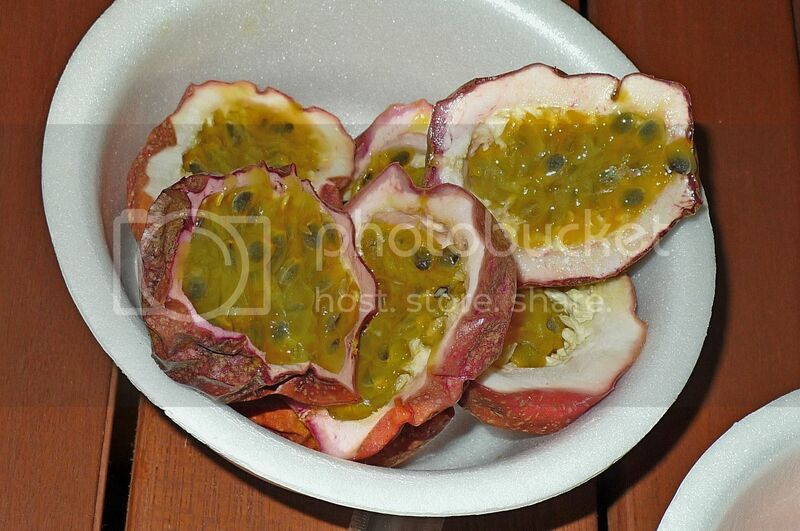 I never knew passion fruit looks that ugly from the inside. Needless to say, we don't have fresh ones in my city. I think I smell more of them from handsoap, moisturizers, and shampoos than from eating passion fruit flavored foods (err...I'm sure artificially flavored). The shangri-la box is so beautiful. I would want one too. 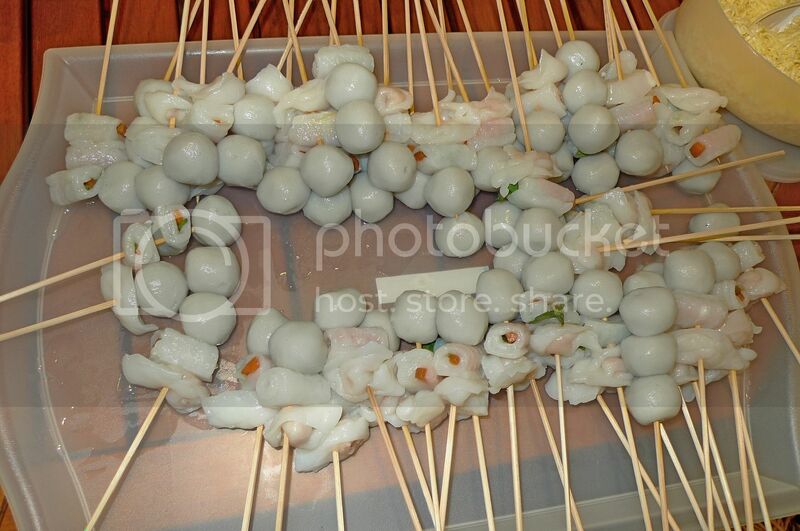 We don't use wood skewers for our fish balls although that is a good idea. I'll do that when we have our next 'hotpot'. haha, Merryn sounds crazy. Foong, I think she's poisoned by us already ! lol. Wah so much delicious food! Since it's always too much for you guys, next time remember to invite me as well! LOL! That must have been one yummy meal. Have them on a stick is a great idea in the hygiene department. All the prep-work must have taken a lot of effort. You helped or not? 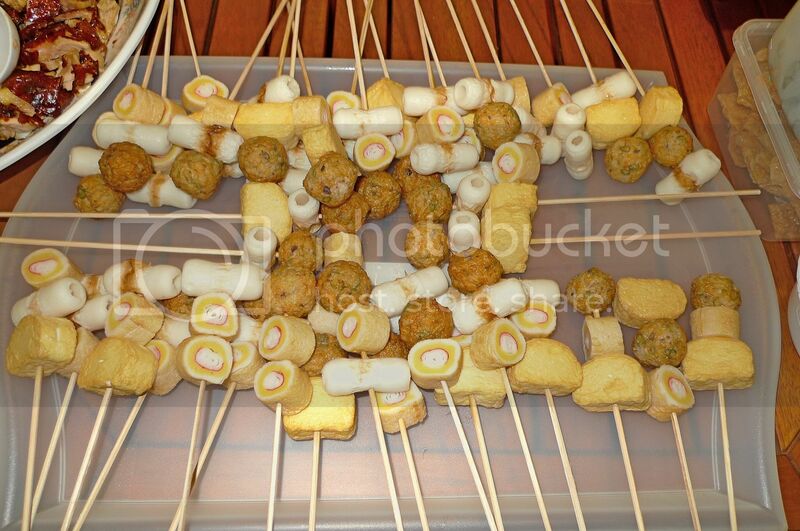 I like the table and am fascinated by the big platters the uncooked sticks of food are placed. What are they? Plastic platters? Please enlighten. See what I meant about effort? Even the prawns were deshelled! Were there quails eggs? My fav..
Hey, WV is very smart! I got 'unflower' - to match my word of 'deshelled'? Strange, eh? 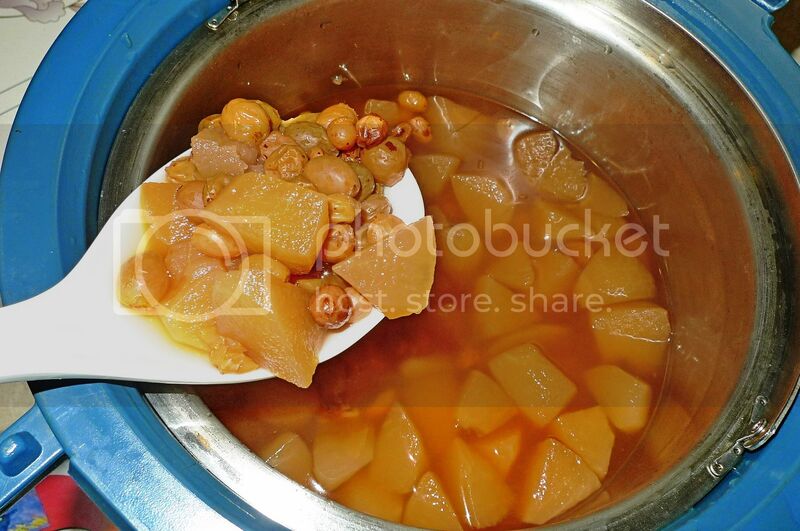 My current preference for steamboat is the porridge type, esp when there are crab pieces in it too. Yum! 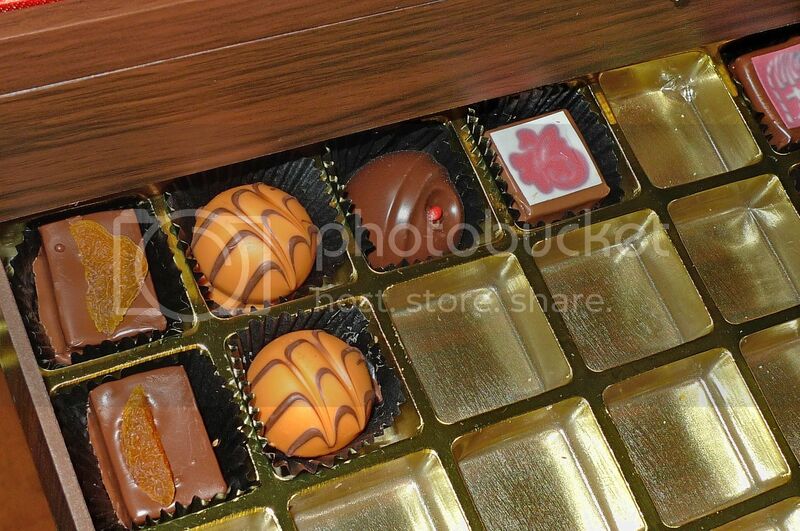 What a pretty chocolate chest! 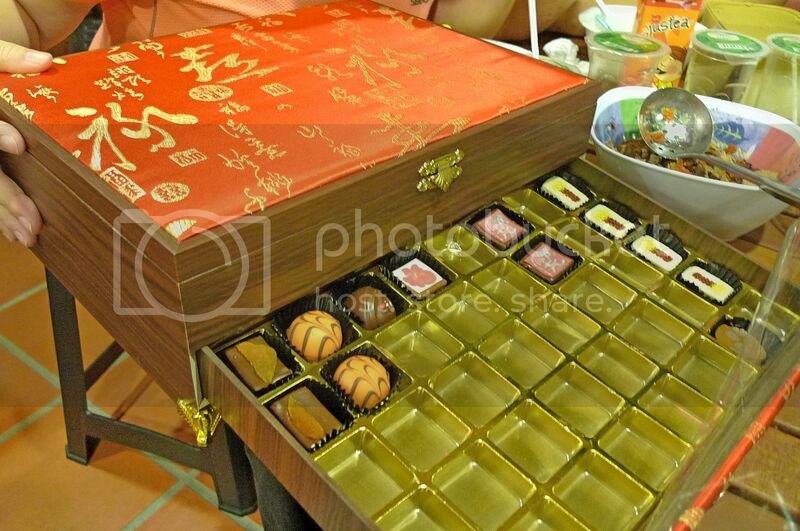 I too collect boxes/chests and have quite a variety of wooden chests for mooncakes - some from hotels. LOL! 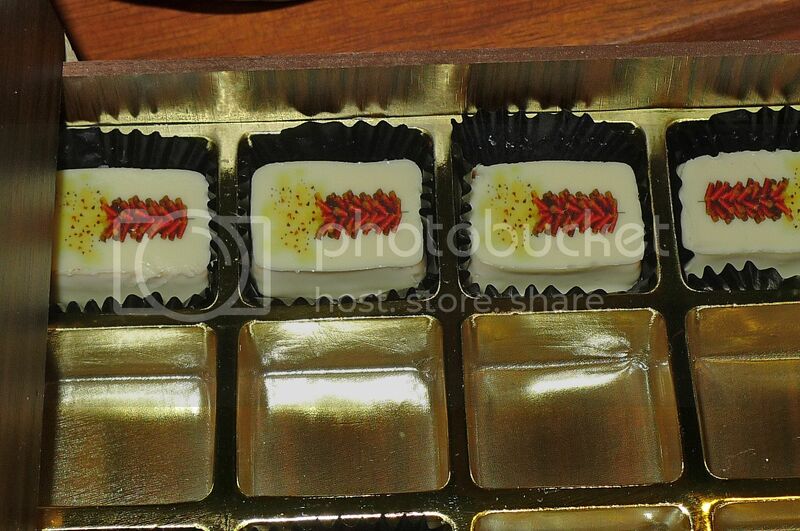 The chocolates do look like mahjong bricks.. and erasers too, eh? Having fortune cookies in a group is great fun. My friends and I would read them out loud one by one. Did you all do the same? 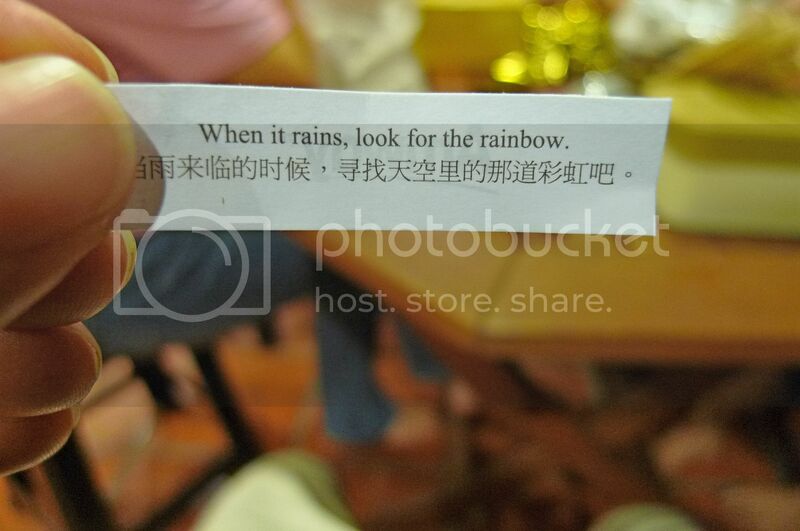 When it rains, look for the rainbow alright. Yep, it's important to be positive. Have a great year ahead, Foong, until the next potluck..
Wow.. It's a feast indeed!! hey, i love steamboat.. but i think i've had enough during CNY - will not touch that for a period.. hahaha!! wow, i thot steamboat is already a lot.. and not after i scrolled down to see more food - i almost fainted!! that box of chocolates is really impressive!!! not to mention how nice the packaging is, i think the chocolates inside looks really pretty, very nicely decorated!! hehehe, so did your fortune cookies message bring you some luck?? go and buy lottery!! hahaha..
hmmmm, seems like everyone is bringing something to the potluck.. what did you bring foong?? didn't see you mentioning?? It is really nice party! She is very good to prepare a lot food for you and your friend. Cool! She really can cook and prepare a lot damn look nice food. She is capable be a good housewife. Hahaha am I right? Mr Foong. So much food! I would 'attack' the box of chocolates! oh i love steamboat! but kinda curious about passion fruit. suppose red one better? rose belle, no passion fruits in your city? Well, at least you have artificial flavored passion fruits in your handsoap and moisturisers! Haha! happysurfer, nope, I didn't help. The host did all the work, haha! I think yes, those uncooked food are placed on plastic platters. Pretty neat, eh? Yes, the prawns were deshelled - it was fantastic! LOL! No quail eggs, I'm afraid, but I don't mind at all. 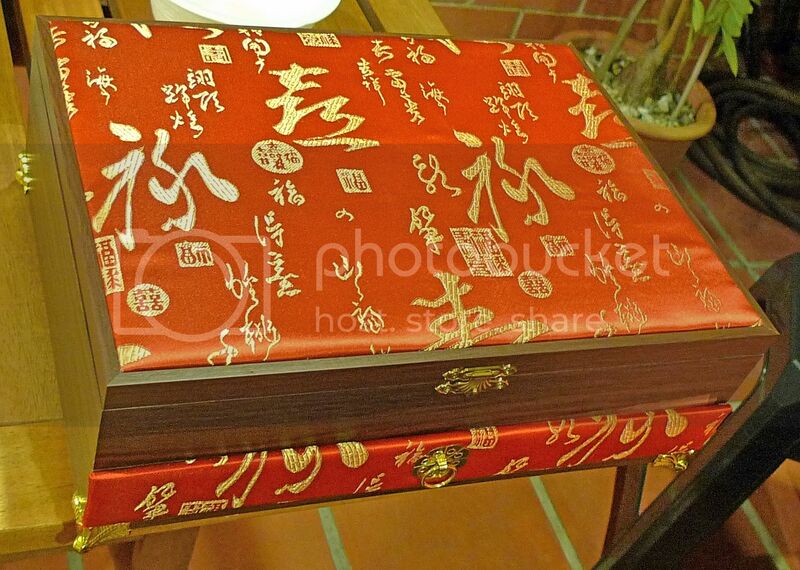 So you collect mooncake boxes? haha! I used to do that too until I realised there's no more room for them so out they went! 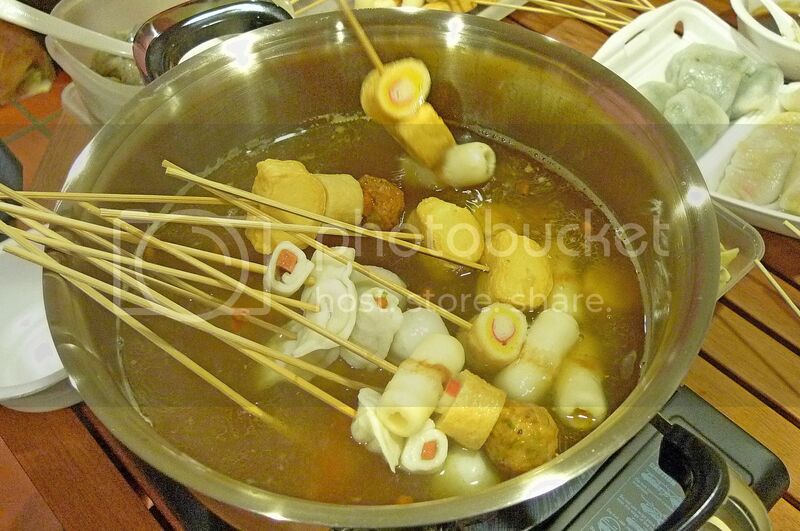 SK, haha yes with the skewers you won't lose your fishball in the pot. We are big eaters, hence the huge amount of food! Hehe. You still need to pay for my gym membership, but I guess my friends are partly responsible too. LOL! Yup, the spaghetti was excellent! Yeah, nice chocolates and choc box - I wish I can have that box! Haha! Of course I brought something - you missed it, go read again! Haha! The ones that have firecrackers printed on them, are they chocolate too? Fascinating!